German freelance reporter Billy Six opens his video with this line before moving on to mingle with people waiting for a Homeland Card, a document which “allows them some benefits, like the right to buy cheap food boxes.” Throughout the 9-minute footage, he refers to prices and wages and lambastes Maduro’s government with no sparing of sarcastic remarks. It’s just one of the many videos uploaded on his YouTube channel, whose dashboard reads: ‘INDIANA JONES of journalism’, and it shows pretty well his style. Billy’s work consists mostly of traveling in crisis-affected countries and having the locals telling their story in front of a camera. He moved to Venezuela over a year ago to report on social unrest and the economic collapse of the country. In the northern Paraguaná peninsula, Billy was investigating drug trafficking activities, smuggling of fuel and strategic material, and even human trafficking – crimes much present in that part of the country. On November 17, he was arrested at the Los Taques Beach Hotel in the town of Punto Fijo by the military intelligence service and transferred to the infamous El Helicoide political prison in Caracas. The day after, a military court charged him with ‘espionage’, ‘rebellion’, and ‘violation of a security zone’. If convicted, Billy could face up to 28 years in prison. “The outrageous allegations are a clear sign that Billy Six is in jail because of his journalistic activities,” said Christian Mihr, the head of the German chapter of Reporters Without Borders. So far, Venezuelan Information Ministry hasn’t responded to a request for comment, and German diplomats have not been allowed to visit, which is a right guaranteed by international law. Moreover, citing privacy law, German Foreign Ministry refused to give any details about the case. According to the Committee to Protect Journalists (CPJ), of the three journalists known to be imprisoned in Venezuela this year, Billy is the only foreigner. In recent years, several unwelcome foreign reporters have been detained. Usually, they would stay in custody for a few days before being expelled and barred from re-entering the country. If you consider that in June 39 prisoners jailed for acts against the government were released as part of the conciliatory measures undertaken by the authorities aimed at uniting the nation, the case of Billy appears to be pretty anomalous. Six weeks after his arrest, there have been no updates either about Billy’s conditions or the charges against him. He’s not allowed any contact with the outside world and can’t choose his own civil lawyer. 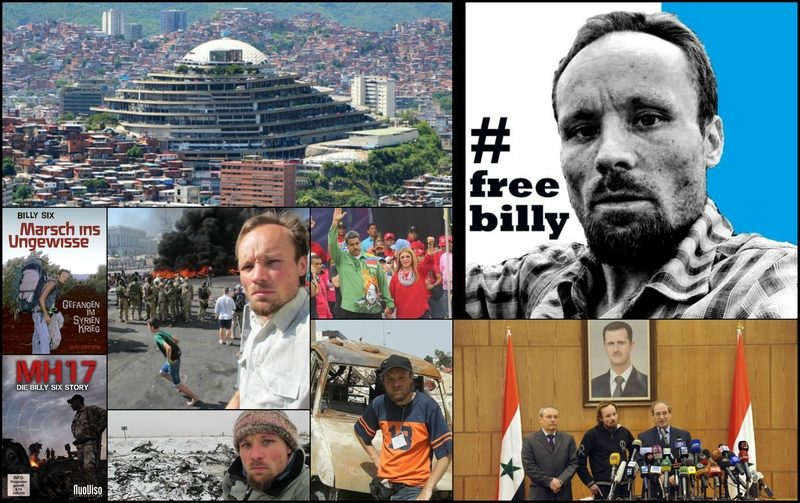 Billy’s incarceration has generated little interest in German mainstream media despite the fact that he has contributed for 12 years to several media outlets, such like D Magazine, Raum & Zeit, Globetrotter, Jüdische Allgemeine, Preußische Allgemeine. Junge Freiheit published his reports largely unedited. Its spokesperson Bastian Behrens believes that there is deliberate discrimination toward Billy because he used to write for conservative media. Ronald Glaeser, an editor of that same weekly, said that Six “goes into places and situations that most journalists wouldn’t try to go.” He’s right. Billy and I got acquainted in Donetsk back in 2014. He arrived at the city hitchhiking and carried a tattered backpack full of camping gear. I had been there since the outbreak of the turmoil and he had many questions. So, we spent much time talking and he filled a number of notepads (yes, he wrote freehand). Among the topics, the imprisonment and murder of Russian war-correspondent Andrei Stenin. Unlike most foreign reporters, Billy wasn’t much affected by the misrepresentation of facts parroted in the Western MSM (among whom the German ones were no exception). His CV already included imprisonments by foreign governments during reporting trips. In 2011, he was arrested by Egyptian state security and by the ‘rebels’ in Libya’s Benghazi. In early 2013, he spent 3 months in a Syrian prison run by military intelligence. He had entered the country through jihadist-held territory on the Turkish border and was arrested by Syrian troops while he was on a car. Kept in solitary confinement in a cold and dirty cell, he wrote a note on the wall: ‘I am Billy Six, a German journalist. I was arrested somewhere in Hama, and I am detained here.’ After he was moved out to another cell (as it happened routinely), a female detainee was placed there and read his message. She shared it with another detainee, Khitam Benian, a young woman arrested at a demonstration. Khitam was released soon after and fled Syria to Saudi Arabia, where she contacted the German embassy. On March 5, Billy was handed over to Russian diplomats, who had helped secure his release. A press conference was held in Damascus by the Syrian government. The Russian Ambassador and Syrian Deputy Foreign Minister were in attendance. The Syrian Arab News Agency announced his release on Twitter and reiterated the government’s position that Billy had entered the country illegally. At that time, the Turkish border was the transit-point of choice for many Western journalists, as it was controlled by the so-called ‘moderate rebels’, whom the Western MSM so much sympathized with. Billy was supposed to enter the country flying to Damascus with a work visa for journalists in his passport, and then obtain a press accreditation. In my opinion, had Billy been involved in whatsoever illegal activity or linked to the jihadist insurgency to topple Assad’s government, the Russian diplomats hardly would stand up for him and help him out of prison. Possibly, the reasons for his incarceration in Venezuela are not dissimilar to the reasons for the previous incarceration in Syria. According to Venezuelan rights group Espacio Público, Billy entered the country by land from the Colombian city of Maicao on public transport. The organization pointed out that local authorities have provided no evidence that he did anything illegal in doing so. Germans are required to have a visa only if they arrive by ship or by land in private cars. The fact is that foreigners are obliged to leave Venezuela after a determined period of time, as well as they must wait a determined period of time before to be allowed to re-enter. Given what I know of him, I wouldn’t be surprised if Billy hadn’t bothered about these ‘details’. All the ‘illegal’ of such a shebang would boil down to have remained in the country longer than allowed. According to the United Nations, Venezuela is facing the worst economic crisis of its modern history, with runaway inflation and shortages of food and medicine. Either in spite of the disaster or because of it, president Maduro remains in power. He has weathered months of mass street protests, isolation from neighboring countries, threats of military intervention from the U.S., declining oil revenues, dissent within his own party, a mass exodus of his people, an attempt on his life. Military leaders run the food and oil industries and control the mining of gold, diamonds, and coltan. Maduro has gone to great lengths to secure their loyalty as they are the most powerful group that could turn on him. At the moment, all facts and circumstances aren’t known yet, thereby it’s not possible to say whether Billy went beyond his regular professional duties or was involved in whatsoever activity outside his profession. Personally, I know for a fact that Billy loves his job and wants to do it in the best way. He has no lack of skills, courage, and integrity. Therefore, I highly doubt that he considered taking on the role of revolutionary or spy – and lest we forget, it’s a common means of authoritarian regimes to accuse journalists of espionage. I’ve followed his reportages over the years: he’s always been unbiased in doing his duty, and he’s never acted in somebody’s interest, let alone at his own advantage. As for the Donbass crisis, he zeroed in on the downing of the MH-17 for four months and drew conclusions that were by no means in line with Western MSM. He interviewed more than 100 people around the crash site. Seven of them saw a fighter jet on July 17, 2014, and one saw a missile being launched by a plane. Billy’s conclusion was two fighter jets shot down the MH-17 – one firing its cannon, the other firing a missile – and he did not refrain from saying it in a BBC documentary.